According to reporting from the Washington Post and others, the Trump administration has reached tentative agreement with the incoming presidential administration of Andrés Manuel López Obrador (aka AMLO) that people seeking asylum in the United States will be detained in Mexico rather than the United States while their cases are resolved. The name of the plan is..."Remain in Mexico." Clearly, the creative juices were flowing on the day they came up with that. The Trump administration's motives here are very clear. This will allow them to get around rules that place limits on the domestic detention of asylum-seekers, particularly children. At the moment, the U.S. government has 14,000 minors in its charge, a record number. Requiring asylum seekers to remain in Mexico will also reduce the number of people who attempt to make the move (since Mexico is more dangerous than the U.S.), and will allow Donald Trump to proclaim a victory. Of course, it will also make it much harder for him to use immigrant caravans to whip voters into a frenzy in 2020. Not that he won't try, of course. The motives of Team AMLO are a little less clear, particularly given that AMLO ran an anti-Trump campaign, calling him a "neo-fascist." The folks negotiating on AMLO's behalf say that the new agreement simply formalizes the existing status quo, since many asylum seekers end up hanging out in Mexico, anyhow. That doesn't exactly pass the smell test, though. After all, if that was true, why would 14,000 children be in U.S. custody right now? Presumably there is some other motivation. And since neither side seems to be sharing what that motivation is, it's likely something that would not look good from a PR standpoint. For example, one wonders if there won't be some sort of cash payment made from the U.S. to Mexico, a detail that Trump would prefer not become public? Or some sort of trade concessions, which would be similarly bad for the "America First" Trump to admit to? As we noted yesterday, the Trump administration was required to release an extensive report on global warming. The report was full of doom and gloom, and ran 100% contrary to the President's "What, me worry?" position on the issue. So, Team Trump tried to sneak it in under the radar, releasing it on Black Friday, while hundreds of millions of Americans were recovering from Thanksgiving, shopping, and/or watching college football. Environmentalists also piped up. For example, climate scientist Philip Duffy, who said, "Obviously, they timed the release to get the minimum visibility." The report itself has given the Democrats plenty of ammunition to work with. And given that the members of the blue team know for certain that Trump is embarrassed by the contents, it makes them all the more certain that they've got a winner. "Rather than hiding the facts, President Trump should heed the message of our nation's preeminent climate scientists and experts," said Rep. Frank Pallone (D-NJ), who will chair the House Energy and Commerce Committee. "The days of denial and inaction in the House are over as House Democrats plan to aggressively address climate change and hold the Administration accountable for its backward policies that only make it worse." Rep. Eddie Bernice Johnson (D-TX), who is expected to chair House Science Committee, issued a statement in which she said the time has come to look seriously at the wildfires, devastating storms, coastal flooding and toxic algae blooms that hit much of the U.S. this year. "That is why I have made climate change one of my top priorities for the Committee going in to the next Congress," she noted. It's still something of a mystery as to why Mitt Romney ran for the Senate. At 71 years of age (and 72 in March of next year), he's getting a little long in the tooth for a body where it takes 15-20 years to gain any real power. Unless he plans to serve into his late eighties or his nineties, then it's an unusual way to spend what are supposed to be his golden years. The new Congress hasn't even met, however, and Romney has already hit the ground running in a manner that certainly hints at what his plans are. He's not working on legislation, or securing plum committee assignments, or constituent services, though. Nope, he's doing what Mitt does best: raising money. On Tuesday, in fact, he'll be hosting a swanky $5,000-a-plate fundraiser meant to stock the bank account of Believe in America PAC, his newly-formed political action committee. He's also formed a joint fundraising committee called Team Mitt. Given that Romney has six years before he has to think about getting re-elected (if he's actually running again), and given that he can self-fund if he really wants to, it is clear that the Utah Senator-elect is planning to assist favored candidates with their campaigns in 2020. In about 48 hours, Mississippians will head to the polls to resolve the last remaining U.S. Senate race. This is a byproduct of the fact that the seat came open due to Thad Cochran's resignation, which means that what happened on Nov. 6 was, in effect, a primary, due to The Magnolia State's unusual procedures for filling a vacant U.S. Senate seat. The current (appointed) occupant of the seat is Sen. Cindy Hyde-Smith (R), who should have no trouble winning the seat outright, given that Mississippi went for Donald Trump by 18 points, and that the state hasn't elected a Democrat to the Senate since 1982, in a time when "Southern Democrat" really meant "Republican." However, Hyde-Smith's jokes about "public hangings" and her other gaffes have invigorated the state's black voters and made a contest out of it. There hasn't been much in the way of public polling, but internal GOP polls have Hyde-Smith up over Mike Espy (D) by as few as five points. Given that internal polls almost always skew in the direction of the party that conducted them, that means that Hyde-Smith's actual lead is probably more like 2-3 points—aka, within the margin of error. Financing/The Border Wall: On December 7, much of the government's funding will run out. If a short-term or long-term funding bill is not passed, then there will be a shutdown. Two things are going to serve to complicate those discussions. The first is that the GOP will want to set a long-term budget that reflects their priorities while they are still in charge of both chambers. The Democrats are not excited about that plan, to put it mildly. The second is that Donald Trump wants funding for his border wall, and the Democrats (and many Republicans) don't want to give it to him. The President has, on many occasions, said he will shut the government down if he doesn't get what he wants. Maybe this time he means it. Foreign Aid: On a related note, Donald Trump wants to cut off aid to several countries, particularly those that are origin points for members of the "caravan." Lawmakers largely do not agree with him. Trump is not known for sticking to his guns when it comes to these wild threats, but if he decides to go all in on border wall funding, consequences be damned, he might also hold the line on the foreign aid. Disaster Funding: On another related note, California is just now getting the last remnants of its wildfires under control, and would like some federal money to help rebuild. Will the Golden State get it, particularly given that Donald Trump hates the state, and that they just booted a bunch of GOP members out of office? Robert Mueller: The Democrats would like to make sure special counsel Robert Mueller is protected, and some Republicans are in agreement with that sentiment. Will there be enough Republicans to get Sen. Jeff Flake's (R-AZ) bill passed, however? We shall soon know, but once Congress adjourns for the term, we will enter into a multi-week period with lots of distractions (holidays, football, etc.). That would be prime time for a Christmas Eve massacre (or maybe a Kwanzaa massacre, or a Festivus massacre). Sexual Harassment: Both the House and Senate have passed bills that would overhaul how Congress would deal with sexual harassment claims against members, but they are pretty different. Some energy will be spent on trying to reconcile the two, and there's a good chance that this will be among the things that gets attached to the new spending bill, so as to make sure that it gets passed into law. Few 2020 candidates have formally declared, as yet, but this week's selection has his hat more fully in the ring than just about anyone. 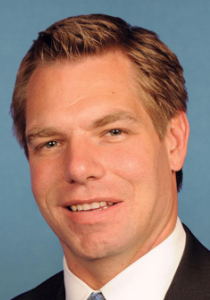 Full Name: Eric Michael Swalwell Jr.
Background: Swalwell has hopped around the country a fair bit in his life. He was born in Iowa to blue-collar parents, grew up in California, started college in North Carolina on a soccer scholarship, and then transferred to the University of Maryland, College Park, where he received both his bachelor's and law degrees. Thereafter, he returned home to Northern California, where he worked as a DA in Alameda County and became active in civic affairs, serving at various times on the Dublin Heritage & Cultural Arts Commission and the Dublin Planning Commission. Political Experience: Swalwell was elected to the Dublin City Council in 2010, and served there for a little over a year before deciding to try his hand at a congressional run. Thanks to California's jungle primary system, his competition in both the primary and the general election was Democrat Pete Stark, a 20-term incumbent. Aided a bit by post-census redistricting, as well as the fact that Stark had fallen a bit out of step with his very liberal district, Swalwell knocked him off. He's been in Congress ever since, which means he's about to start his fourth term. Signature Issue(s): Bipartisanship. Although Swalwell is unquestionably a liberal, he has made reaching across the aisle a focal point. To that end, he helped found the United Solutions Caucus, a bipartisan group of representatives that meets regularly to discuss areas of agreement. Instructive Quote: "My back's not big enough for the number of targets on it." Completely Trivial Fact: If elected, Swalwell would easily beat Theodore Roosevelt's record for youngest-serving president ever (42), and John F. Kennedy's record for youngest person to be elected president (43). However, he's already missed out on his chance to beat William Jennings Bryan as the youngest major-party presidential nominee (36). Recent News: Swalwell's outspokenness on the need for (some) gun control has ruffled feathers in the past, and this week he had the right-leaning media in an absolute tizzy when he tweeted that guns are no longer a hedge against government tyranny, since the government has nukes. Virtually every prominent right-wing outlet, including Fox News, Breitbart, The Daily Caller, the Conservative Review, the Washington Examiner, and the Washington Times managed to (disingenuously) spin that into stories about how the Congressman wants to take away everyone's guns and to nuke anyone who doesn't agree. Three Biggest Pros: (1) Younger voters will like someone closer to their own age as opposed to their grandparentes' ages; (2) Swalwell is a wizard of social media, and has gotten into hot water a couple of times for using his phone to document the goings-on in Congress for his constituents (The Hill calls him the "Snapchat king of Congress"); and (3) The Congressman has a record of actually getting things done; for example, he was the only freshman member in the 113th Congress to see multiple bills that he sponsored become law. Three Biggest Cons: (1) Eric who? ; (2) Swalwell's tendency to shoot from the hip tends to do him more harm than good; and (3) Seriously, Eric who? Is He Actually Running? : Yes. Though he has not filed any paperwork, his people are telling anyone who will listen that he's in, and Swalwell has been doing the usual things that would-be presidential candidates do. In fact, he was the first 2020 hopeful to visit Iowa once the midterms were over, having arranged to be there the Friday after the election. Betting Odds: No odds, yet, which is not a good sign for Swalwell given that the books are more than happy to offer odds on ultra-longshots like Al Gore, Oprah Winfrey, Lady GaGa, and Jim Webb. The Bottom Line: In a world where Donald Trump can become president, anything is possible. However, any lane Swalwell might occupy in 2020 is already filled by someone more prominent. California liberal? Rep. Adam Schiff or Sen. Kamala Harris (both D-CA). Charismatic and young? Rep. Beto O'Rourke (D-TX). Speaks his mind, consequences be damned? Sen. Bernie Sanders. Able to reach across the aisle? Joe Biden. Presumably, Swalwell does not think the big prize is actually in reach this time around, and is merely trying to heighten his profile in anticipation of a future presidential run, or a run at Dianne Feinstein's Senate seat when it's up again in 2024. Nov21 Whitaker Was Paid over $1 Million by Conservative "Charity"